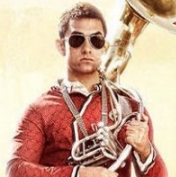 PK, one of the most expected films in Bollywood is just a couple of weeks away. It is seen as a fresh movie with different directorial aspects. The trailer and back to back online promotions have given the movie a great kickstart. Produced by Rajkumar Hirani and Aamir Khan and directed by Rajkumar Hirani, PK's entire cast and crew seems very excited about the film. Aamir has tweeted "Guys, I just saw the final copy of PK. I'm excited! I think we have made what we set out to". He adds about his director "Cant wait for 19th Dec when you all will see the film! Raju is the no 1 director". The hype is no less in Bollywood industry as the count down has begun for December 19th. Vijay 58 - To make a major Bollywood splash? NKPK Director Is Blessed With A Baby Girl. People looking for online information on Aamir Khan, PK, Rajkumar Hirani will find this news story useful.